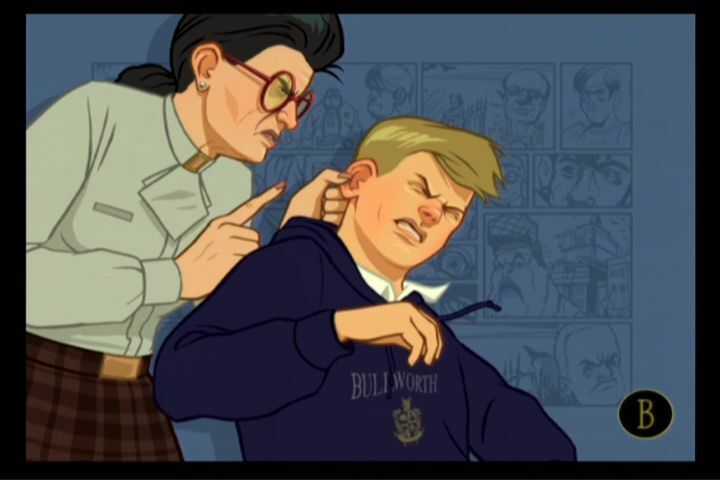 Bully review Game Over Online - http://www.game-over.com Rockstar brought the sandbox genre to prominence with a surprising hit in GTA III, so it's only fitting that they'd revive it after years of stagnation caused by copycat games like True Crime that butchered the concept. Now, Rockstar has gone from the gritty streets of Liberty City to the opulent buildings in Bullworth Academy. 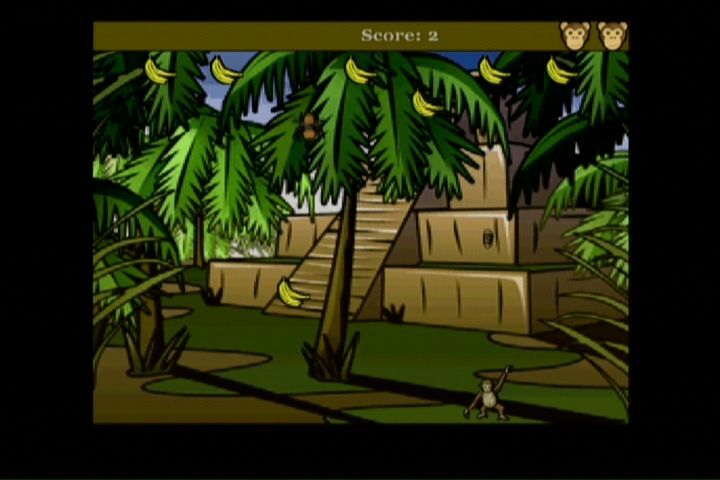 As insane as it may sound, this game centered around an under-appreciated child named Jimmy Hopkins and his adventures in a boarding school run by lackwits is exactly what sandbox games needed - its a huge departure from the usual urban setting and does a good job representing every style of gameplay contained within it. The major grievances I (and many others) had with the GTAs was that they gave you a lot of options for gameplay, but very few of them were executed well. Take the taxi driver missions for example. 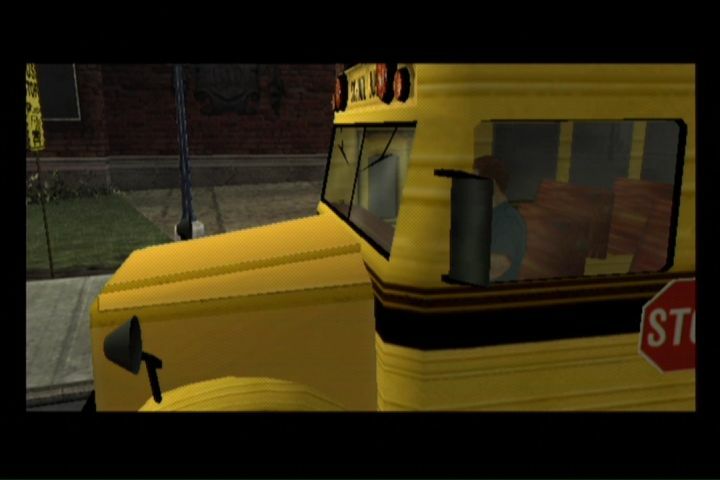 They were fine in theory, but hampered by slippery driving controls in III and VC, and then the controls were tightened up in San Andreas, and they actually became fun to play. 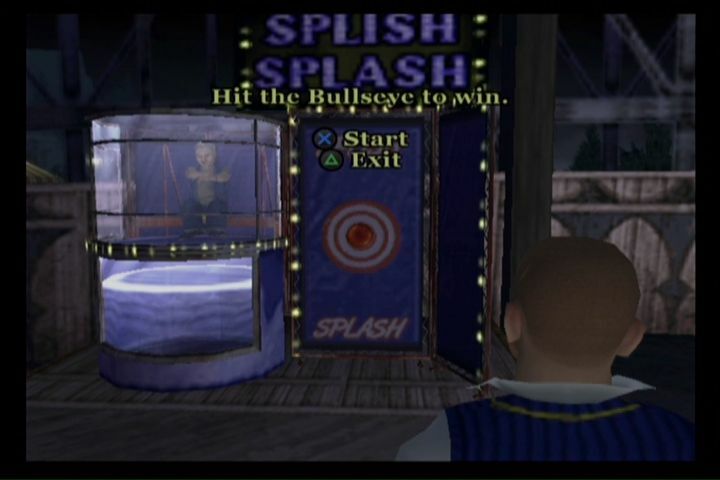 With Bully, its first effort features sharper controls in most areas than the latest GTAs. 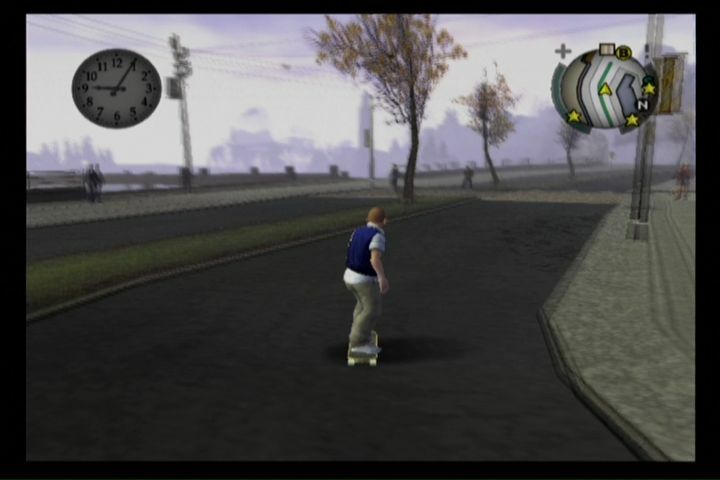 Biking is easier to do here than in San Andreas, while the skateboard is perfect for people like me who enjoy the idea of virtual skateboarding, but don't feel like getting the newest Tony Hawk game to enjoy it. Here, I can get in as much or as little skateboarding as I want, and no other game will allow me to skateboard through the hallways of a school while knocking over students and faculty at will. San Andreas was the first Rockstar creation to feature classic arcade-style games within the game, and that has been expanded here to include loving homages to console hits as well. Arcade classics like Super Sprint, Qix (in the form of an art class assignment), and even Paperboy are paid tribute to here. Console games are spoofed as well. 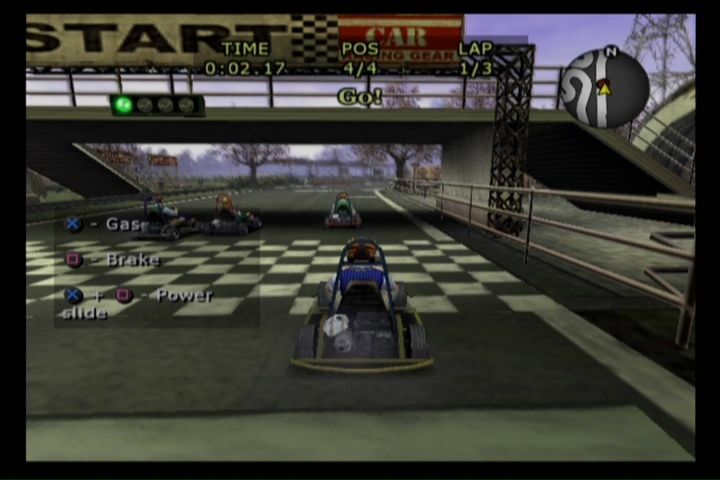 The rhythm genre is represented by chemistry class, while an F-Zero-inspired 3D racing game is available for play as well. 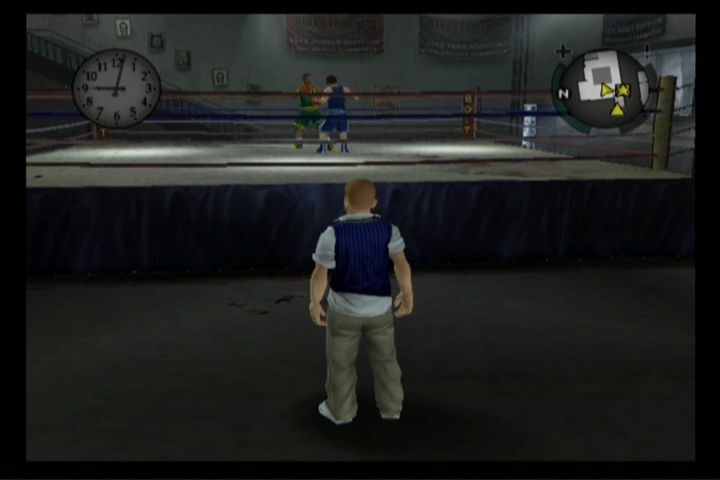 Side-scrolling shooters get some love in Bully, and you can also box far better here than in San Andreas. Some of these games (like the classes and paper route) can be used to progress in the game, either by completing the course, or simply making money to buy clothes or better equipment. Early on, you'll basically have to attend classes since you won't have many places to explore, and you'll need to complete classes in order to gain skills, learn your way around the campus, gain allies, and in doing so, and figure out just how the game and its characters work. Once you unlock the ability to explore the town, and gain the skills needed to either butter up or escape from the clutches of authority figures, you'll be able to do just about anything you want. The school-based portion of the game does an excellent job at giving you the tools needed to figure out how Bullworth Town works, and serves as an enjoyable tutorial that shows you how to best solve the problems you'll encounter in your adventure. After it's done, you'll be able to look back and see how the missions you had to complete early on helped you progress - so whether it's learning new attacks from a homeless drunk, or defending a fat nerd from a pack of â€˜50s era greasers, you'll need to use everything learned in the preliminary parts of the game to make progress later. 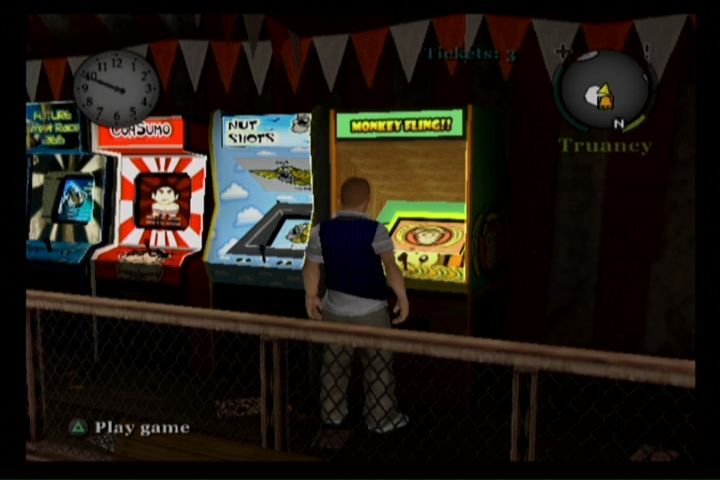 One thing that impressed me most of all with Bully was how polished the mini-games were. In past efforts, the controls would be clunky, or there just wouldn't be enough substance to make them worth playing after their required time. 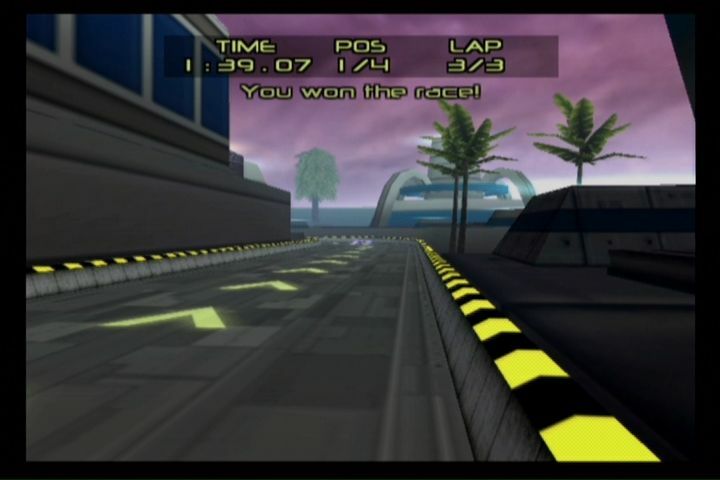 Things that I expected to be shallow, like the boxing, arcade racing, and go kart racing areas had more depth than I was anticipating, and in the case of the go kart racing, it fared much better than the similar Motor Kombat from MK: Armageddon. 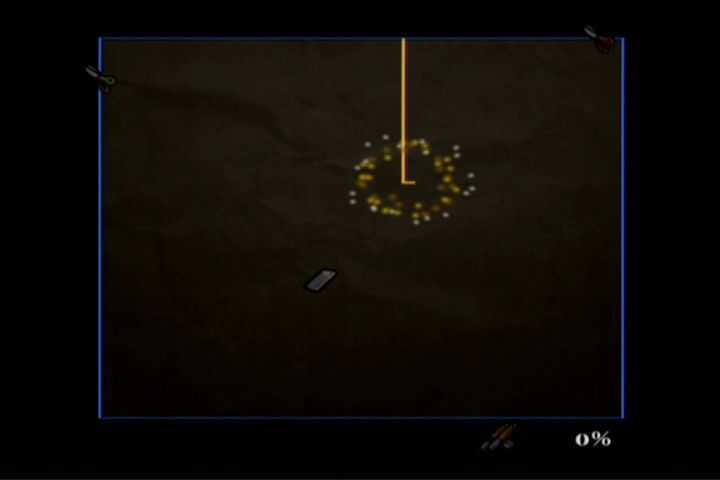 Here, the controls for the mini-game are sharp, which makes them more fun to play time after time. Visually, Bully's world is basically a much more detailed, but smaller version of something youâ€˜d see in a 3D GTA game. Bully succeeds where those failed by making each building look unique inside and out. Most can be entered and explored, which is another change from the GTAs, and they don't blend into each other when you're riding past them. This might not seem like much, but when you're being pursued by a gang who wants to pound your face into the cement, it helps to know which street you're on just by its appearance, which makes it much easier to figure out an escape plan once you get used to the areas. 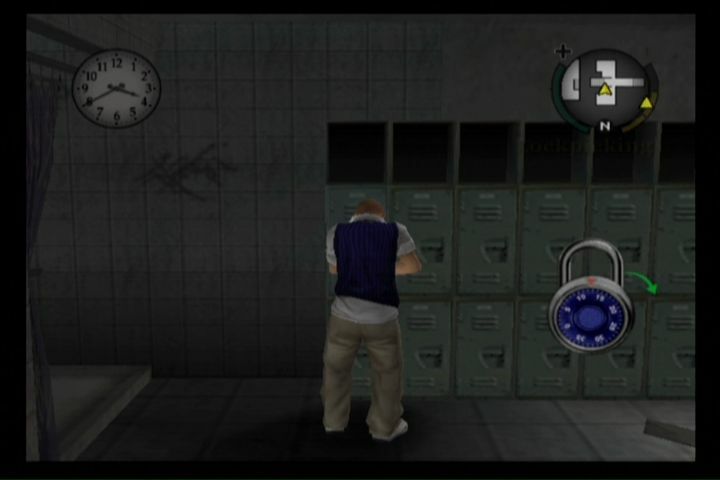 Bully also features higher quality textures than the GTAs, with only a few floors and walls looking muddy. 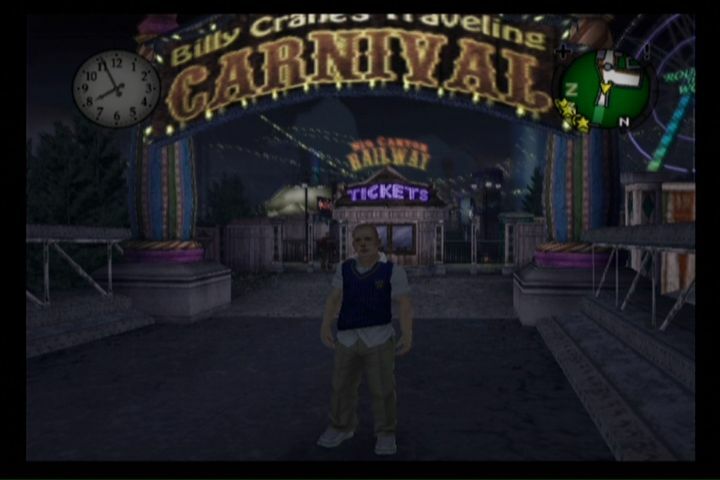 The in-game carnival shows off the detailed environments more than anything else. It's fairly massive, with a lot of playable or otherwise useable areas, and they're all full of little details that you can spot easily - like the rivets on the roller coaster track. 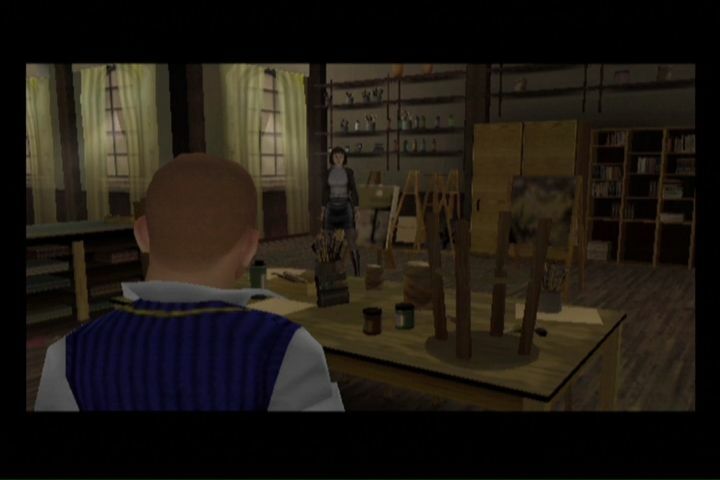 I'm surprised the developers at Rockstar Vancouver were able to pull off such a clean-looking game on the PS2's now-archaic hardware, and they certainly deserve praise for that accomplishment. With so much improvement being shown in regards to the environments actually looking and feeling like real places, I'm disappointed that a lot of character animations are still shoddy. Fighting animations are fine, as punches and kicks actually look realistic, and people react to them as if they're being hit with a hard punch. Running and walking animations didn't fare so well though , as they lack fluidity. In the grand scheme of things, it isn't a major problem, but it did jump out at me here given how many things were improved upon the GTA norm. As we've come to expect from Rockstar's games, there are some glitches that sometimes interfere with play. The most notable one I've experienced was Jimmy's bike horizontally floating above his head until I pressed triangle a few times to make him magically climb on and then peddle away. The wonky camera then led me right into a streetlight and a waiting cop, who arrested me on the spot. Normally, I'd be incredibly annoyed by glitches like that, but since they don't happen all that often, and can result in some great comedy, I'm a little more forgiving. Should Bully hit other systems, I hope that they fix these problems. Until then, I'll continue to laugh at the insanity caused by seemingly rushed programming. Despite a few rough edges, Bully succeeds with its vision, and delivers the best Rockstar sandbox experience to date. In terms of living up to its concept, I'd place this right up there with Vice City because this captures school just about as well as that did the â€˜80s, and provides a far better actual game to go along with its premise. I would love to see it executed on more powerful hardware though, since it's clearly held back by the confines of the PS2. Given the hardware, this is an incredibly massive game and one that should be played by all sandbox gaming fans. Rockstar brought the sandbox genre to prominence with a surprising hit in GTA III, so it's only fitting that they'd revive it after years of stagnation caused by copycat games like True Crime that butchered the concept. Now, Rockstar has gone from the gritty streets of Liberty City to the opulent buildings in Bullworth Academy. As insane as it may sound, this game centered around an under-appreciated child named Jimmy Hopkins and his adventures in a boarding school run by lackwits is exactly what sandbox games needed - its a huge departure from the usual urban setting and does a good job representing every style of gameplay contained within it. 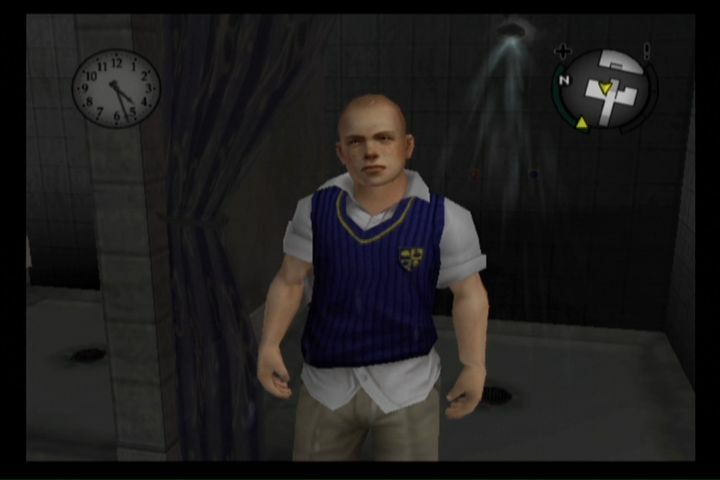 I'm surprised by just how much controversy there was behind Bully, since it's so tame compared to the stuff you'd see in a GTA. 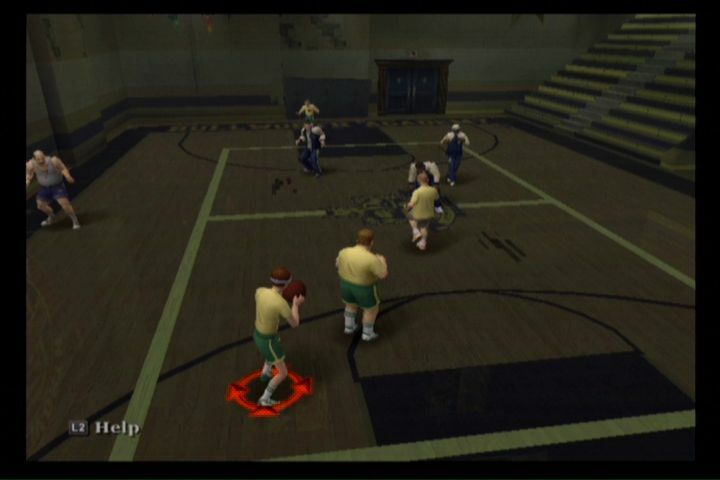 Bully is definitely deserving of every accolade it gets, but many of the complaints against its content seem absurd after playing it. There's no graphic violence, and much of the fighting is done out of either self defense or in defense of someone weaker than their attacker. Needless violence is punished in the game, so there's even a moral lesson to be learned from it. Hopefully time allows people to forget about the pre-release complaints, and instead focus on the enjoyable gaming experience Bully provides.